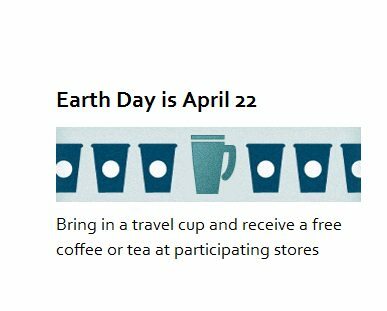 In honor of Earth Day this year, Starbucks is offering customers free brewed coffee or free tea if you bring your own re-usable cup, tumbler, or mug for your drink. Using personal cups is an important part of being “green.” Reduce is the first of the three Rs. (Reduce, Reuse, Recycle). If you bring your own cup, mug, or tumbler into Starbucks, you are reducing your consumption – you’re not using a a paper cup! So please re-use your own personal tumbler! I owe a big thank you to Hayley, a regular reader of this blog, who noticed the blurb on the Starbucks community site and pointed it out to me. 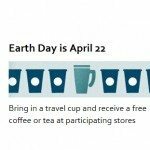 In the past Starbucks, traditionally has done something special for Earth Day, so this event is absolutely in keeping with Starbucks strong interest in corporate social responsibility. As I recall, in the past, this free coffee event has been in both the United States and Canada (and it might possibly be world-wide), and it is free coffee or tea for people with their own cup. There are no free espresso-bar beverages, and no free blender beverages (as I recall). I remember last year seeing tons of people at my local store with their re-usable cold cup getting iced tea too. I might dust off my cold tumbler too and bring it in. I might have a cup in each hand! (j/k). I’m looking forward to free coffee! I drink plenty of brewed coffee, so this kind of event tickles me pink. Though more importantly, I hope this free coffee event will encourage some people to regularly bring in their own cup to Starbucks. We need to do this for our planet! Shared Planet update on re-usable cups – April 2010 StarbucksMelody blog post on the percentage of customers using a re-usable cup. Five Awesome Baristas – This is so genuine! A Starbucks partner in Canada (now a former partner) talking about C.A.F.E. practices. Shared Planet – An introduction – This is my short, easy to read, introduction on CAFE practices is. 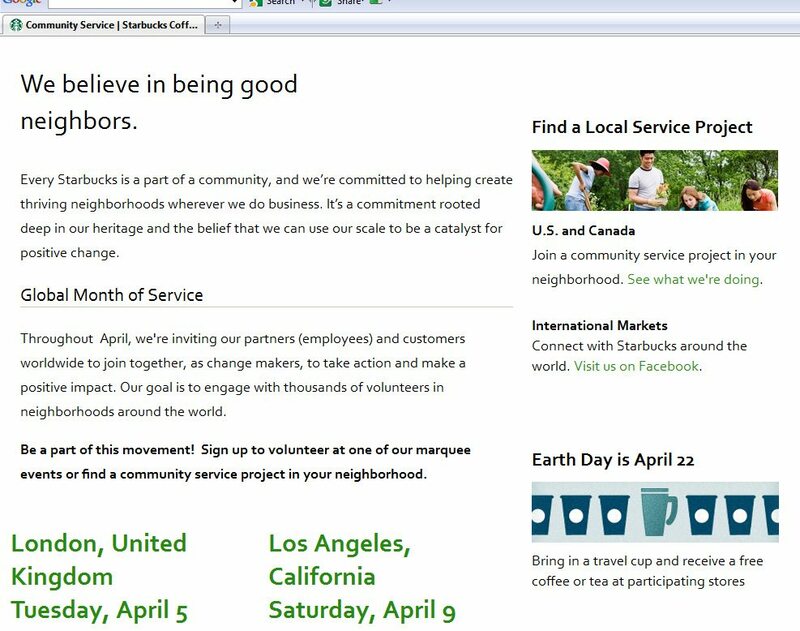 Starbucks is committed to being responsible and so they use the term “Shared Planet” to describe the many programs, donations, good deeds, and things they do to improve our planet. This includes things like how coffee is sourced, the volunteer hours that partners give to their communities, and the fact that there is always a cup discount when you bring your own personal, cup, mug, or tumbler into Starbucks. While April 22, 2011, might be free coffee day, you can get ten cents off your drink every single time, every day of the week, when you bring in your own cup, mug, or tumbler for your drink. Starbucks video – Bring in a tumbler 365 days a year, save ten cents a day and 365 paper cups. Hope you enjoyed your friendly free coffee announcement! Who here is going to join in? #MerryChristmasStarbucks and for the rest of us, there’s Festivus! Get Your Half Off Frappuccino on Monday, December 5, 2016!! I love Earth Day! I think it’s such a brilliant idea for Starbucks to risk $ loss to do this! Great stuff! Thanks for the heads up, Melody! I’m big on using reusable beverage containers, so this is right up my alley! No one in this day and age should be using one-time use cups. My guess is that they will send out an email but not until April. Or maybe post something on MSI in April. It istrue 🙂 And it is defs happening in Canada too, since that’s where I am! My understanding is brewed coffee, iced coffee (if available at the store), hot tea, and iced tea are all fair game! One of my customers pointed out that Good Friday and Earth Day are the same day this year, so I’m curious to see how it affects us!! Thanks for linking the video! So cool. I’m excited for earth day too and i can’t wait to come to seattle for a couple days soon afterwards. YAY. I usually bring in my reusable cup everyday and it’s a nice way of offering a bigger discount to customers. I guess the advertising for this promotion will be in the stores April 1? No mention of it anywhere around my local SB. Neat. @Lorene R – Thank you for ordering the book through my site! I’ve sold like five or six copies of Onward plus people have bought a variety of other stuff through the Amazon widget. Let me know what you think! I can’t really say thank you enough to all the people who come here and join in this community! Re: Earth Day, I remember the first one in 1970 so clearly. It was spring of my senior yr in h.s. Everything everywhere was in such turmoil. (Kent State was about to happen in May..) I think those days get romanticized alot, generally, but if you lived thru them….not so much fun. Bad bad times…..
It’s a good thing i bring my tumbler every day, i won’t need to remember anything extra to get some free tea! My understanding is that we will be offering a 20% discount on reusable tumblers that day also! We didn’t really get much for promotion of it so maybe stores will whip out some chalk boards?? @Brandon – That is really great information! That’s a sale I might take advantage of. Thank you for sharing that! 20% discount? I could use a new tumbler! Melody, by “personal cups” do you mean mugs? I see a lot of tumblers for both hot and cold drinks brought in. But have never seen someone actually bring in their own mug, although people who order a short or tall size to drink in the store are asked if they want it in a mug. I can’t say for sure that no one brings in mugs because it does say on Starbucks Japan website that bringing both a tumbler or a mug will get you a 20yen discount…but I think it’s rare. And a lot of the stores do have mugs for you to use. I never leave my house without my tumbler. As a commuter who takes public transportation, I prefer to drink out of a tumbler instead of a paper cup because they really keep your coffee warm and it is impossible for the coffee to spill out of it. People have been amazed at my cup when a few times my cup slipped from my hands and dropped but nothing fell out.